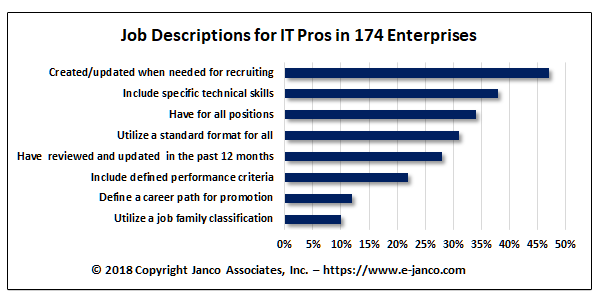 (PRLEAP.COM) (Park City UT) - Janco finds recruiting qualified IT Pros depends on accurate job descriptions - only 34% of organizations surveyed meet this objective - Janco used its Internet and IT Job Descriptions as the basis for this analysis. IT job descriptions provide CIOs. IT Managers, and HR professionals a baseline they can use to better manage the recruiting, compensation, and staff performance analysis. The CEO of Janco, Victor Janulaitis said, "It is important for the success of an IT organization that it find and hire individuals who can have the right skills and can successfully utilize them. In this study, we identified several common reasons why new hires do not work out: job responsibilities not clearly defined, different expectations for new hire and the enterprise; and cultural miss-match. Janco's job descriptions are a tool that provides a proven baseline to address these issues." IT Job Descriptions are continually updated to reflect the latest compliance and new technology requirements. The Internet and IT Position Descriptions HandiGuide is over 800 pages; includes sample organization charts, a job progression matrix, and 288 Internet and IT job descriptions. The book addresses all mandated requirements, including the ADA, and is in an easy to use format. The CEO added, "Checking references is still the most used process for verification of candidate-specific information and skill levels, education and job experience. With almost 1 of 2 (46%) using that as a standard practice." Janulaitis also said, "We discovered that employers now are starting to depend on social media to verify key information that candidates put on their resumes. Janco found in the review of 450 hires at 78 companies, the verification processes used by employers for information on candidates varied significantly. Before job offers are made employers checked references - 46%; depended on the candidate's answers during the interview process - 30%; evaluated candidate's social media persona - 26%; contacted employers/schools listed on resumes 17%; asked follow-up questions of candidates after the primary interview - 6%; implemented probational hiring - 4%; reviewed samples of candidate's work 2%; and tested the candidate during the hiring process 2%." The numbers are greater than 100% as many employers had multiple responses. The Internet and IT Position Descriptions can be purchased separately in MS WORD format or with the full Internet and IT Position Descriptions HandiGuide. Go to http://e-janco.com/IT_Job_Descriptions.htm.